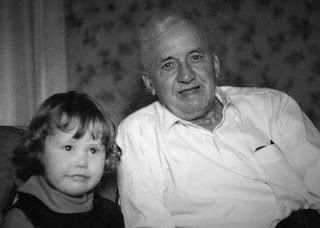 I remember little about my great-grandfather Ignatz Kalina. I have but one picture of him--a fading black-and-white photo of the two of us, sitting together on a couch, in what, I assume, is his living room in Taylor, Pennsylvania. A word to the young: Question your relatives and embrace curiosity because one day you may cherish that information and it may not be at your fingertips. A few years ago I took the time to do some research on the internet about "Pop" Kalina and found a miner's certificate from Moffat Coal. To this day I can't seem to locate it, so any recommendations on how to find it would be greatly appreciated. Through the Pennsylvania Historical and Museum Commission (PHMC), I did find his name on a list of mining accidents. While working as a trackman's helper in his '40s, he was struck in the jaw when a bar slipped. Evidently, he advanced in his profession to become a full-fledged miner, certified to work with explosives only later in life. "Pop" Kalina, who arrived in this country with his bride Paulina, (yes, I got a laugh out of the fact that her first and last name rhyme, in the "Americanized" pronunciation), lived to be 86 years old. The man who toiled in the damp, dark, recesses of the earth for many years, was, by accounts, hale and hearty (as they would say in the old days), and managed to escape the perils of black lung--a condition that struck down so many of those who worked in his profession. 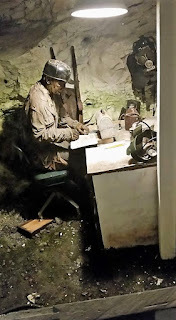 When an editor asked me to visit the Scranton region for an upcoming article, I decided to take advantage of the opportunity to learn more about Ignatz and what it was like to live the life of a coal miner. The first stop on my path to discovery was Eckley Miners' Village. This fine example of a typical coal "patch town" tells a story of how the miners lived when coal was king. Located a bit off the beaten path in Weatherly, Pennsylvania, the "ghost town" is now maintained by the PHMC as a historical site dedicated to educating the public about coal-mining life. There my husband and I viewed a short film as told through the eyes of a coal miner. 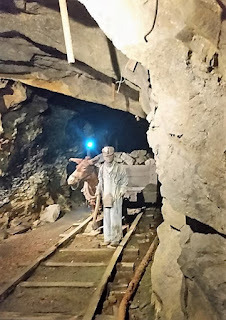 Afterward, we strolled around the small museum, which gave us insight into each job performed by those who worked in the mines, from the nippers to the breaker boys and the miners themselves. Young boys were forced to grow up early in the mining community. There were no "pajama boys," whining about their plight way back when. These pictures of haunted faces are telling and should shame those who have it so much better. Those who thought mining paid well for the era might be interested to know that many were forced to shop at the "company store" for goods sold at elevated prices. Suddenly the old Tennessee Ernie Ford song seemed to make sense. Outside, visitors can stroll the Eckley area with a docent, or drive through the village. The planned community was arranged by social status from east to west. Miners and their families lived on the east side in double homes and engineers lived farther west in single-family homes. The mine owner resided farthest west at the opposite end of town. Pic. 4: A 1968 re-creation of a Breaker which stood near the site of one of the three original breakers. In 1970, Hollywood came calling and a cast and crew arrived in Weatherly to film "The Molly Maguires," a gritty movie based on a true story about Irish coal miners and corporate exploitation.The visit to Eckley was insightful and I was ready to learn more at the Lackawanna County Coal mine where my great-grandfather used to work as an employee of Moffat Coal. I can't help but admit it was a bit of a thrill to walk the same path he walked oh so many years ago. Tours are offered between April 1 and November 1 and are conducted frequently throughout the day. After we parked in the ample lot, we walked a few minutes to the main center where staff provided us with tickets, a hair net and a hard hat. We were then invited to watch a short film about coal mining and browse the small gift shop while waiting the call for the tour to start. When it was our turn, we joined about 25 others and piled into a bright yellow car to make our descent into the mine. I have to say I had a few butterflies plunging slowly down that deep hill into darkness, but hey, I'm supposedly built of good stock, so I stuffed that down and sucked it up. When we arrived at the bottom and were permitted to exit the car, I breathed a sigh of relief. 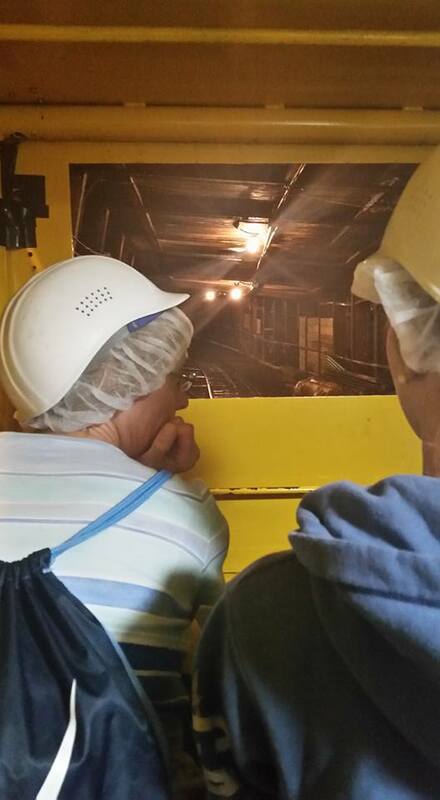 Our guide led us through the mine, describing various duties performed by the workers. We learned that in 1902, the certified rates paid for laborers were 18 cents an hour and breaker boys earned 13 cents--the same as mule drivers. Engineers made $78 a month and nippers were paid the least at 11 cents an hour, likely due to their young age. We also learned that mine workers had to always be on guard, especially for electrocution hazards. Our guide relayed a story about a mule whose ear touched a wire and he was struck dead on the spot, landing on the damp ground with a sickening thud. Perhaps this is why earwear like this was eventually employed. This picture of a mule hate was taken at the Anthracite Heritage Museum. As we made our way through the mine, we peered into the bosses office carved from earth and looking rather, shall we say, rustic? I still imagine "Pop" Kalina peering in and waving a friendly hello here and there. At the end of the tour, we were all given a "mining certificate," earned by doing little but observing how those who were ready, willing and able to contribute to the fabric and success of America by assimilation, grit, hard work and determination. I left feeling thankful and a deep debt of gratitude to those who came before--for their intestinal fortitude, pride and their work ethic and am very proud to count my great-grandfather among that group of fine men. Stephanie, this is a wonderful tribute to your great-grandfather and all like him who worked tirelessly and often in dangerous conditions for little pay so that we could have a "better" life. Wonderfully written. Thank you Bryan--I'm so glad I took the trip--it was an eye-opening experience. I was sad, but proud. Stephanie, I found your post on City Data and came here to see what you had to say. I'm glad I did. I enjoyed your tribute to Ignatz and chuckled at the rhyme Paulina Kalina. A friend was one of the "employees" in the Lackawanna Coal Mine tour. He was a fellow actor and though a retired war time pilot, he "moonlighted" underground. He was in his 70s at the time and he enjoyed educating tourists as to just how difficult it was to be a miner. Thank you for your point of view.